Puckett’s Included in Top 20 BBQ Restaurant List! Well ain’t this the bees knees: Puckett’s Gro. & Restaurant in downtown Franklin has been named one of the best barbecue restaurants in the country (!! ), according to a new book released last month, The 100 Best Barbecue Restaurants in America. In one year, author Johnny Fugitt visited 365 barbecue restaurants across 48 states and kept record of his experiences. The 100 Best Barbecue Restaurants in America is a culmination of his good eats, and blends travel and food writing with creative non-fiction to chronicle the journey, sharing secrets from barbecue kitchens and pointing readers in the direction of America’s best BBQ joints! 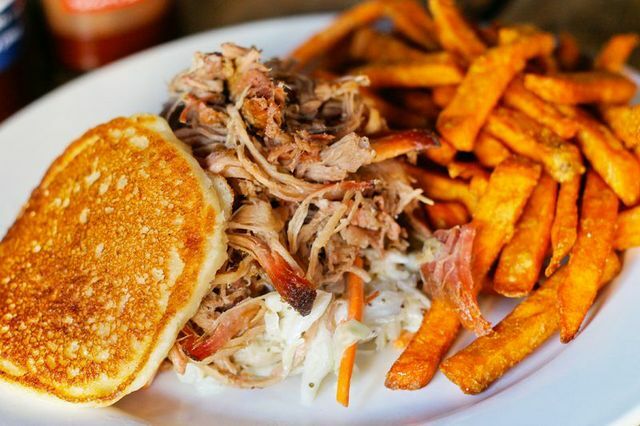 A handful of other Nashville-area restaurants made the Top 100, but Puckett’s was the only one to crack the Top 25, coming in at number 17–quite the honor, wouldn’t you say? For those dining at the Southern restaurant, Fugitt recommends Puckett’s ribs, which he ranks as one of the Top 10 in America. He also praises the atmosphere, where a community-like kitchen is paired with live pickin’ performances a few feet from guests’ tables. Puckett’s ambiance also made its own Top 10 list. Fugitt says he was unsatisfied with Top 10 lists that recycle the same historic or well-marketed restaurants, and was inspired to hit the road to sample it all himself in search of the best. Though some of the anticipated barbecue names made the Top 100, readers may be surprised to find that a few “shoe-ins” are left off. In his book, Fugitt argues that these survive on reputation alone and no longer produce great barbecue–even revealing that one famous BBQ restaurant microwaves its ribs before service. Fuggit’s book is available on Amazon for $15.99. To learn more, visit his website at www.barbecuerankings.com or follow his brand on Facebook at www.facebook.com/barbecuerankings.